Actors John Krasinski and Wendell Pierce joined the USO in Los Angeles on August 31 for a special premiere event of Amazon Prime’s new series “Tom Clancy’s Jack Ryan.” The event, which took place aboard the USS Iowa, was in collaboration with LA Fleet Week – a celebration of the U.S. Armed Forces. Amazon’s new show – released August 31 – brings the iconic spy character back to the screen with the latest iteration of the world-famous book series. John Krasinski plays the titular character – a CIA analyst pulled from his desk job and placed in the field amid an international terrorism plot – in the streaming TV series. But before the Jack Ryan character was a CIA spy, he was a U.S. Marine. 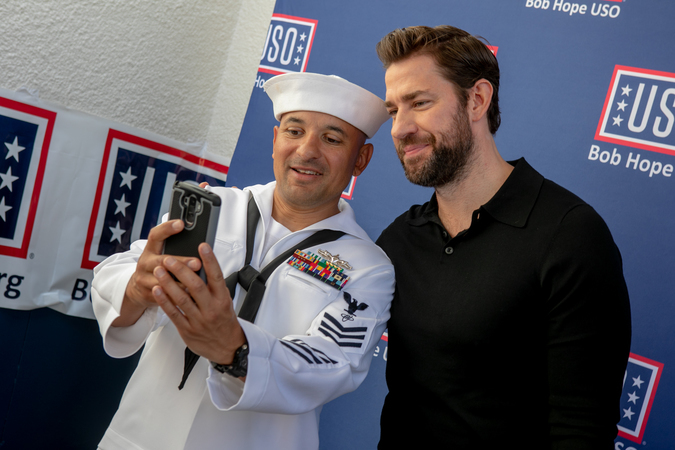 Krasinski met real-life sailors and Marines aboard the USS Iowa with the USO to talk about the new show and his experiences stepping into the shoes of our service members on set. 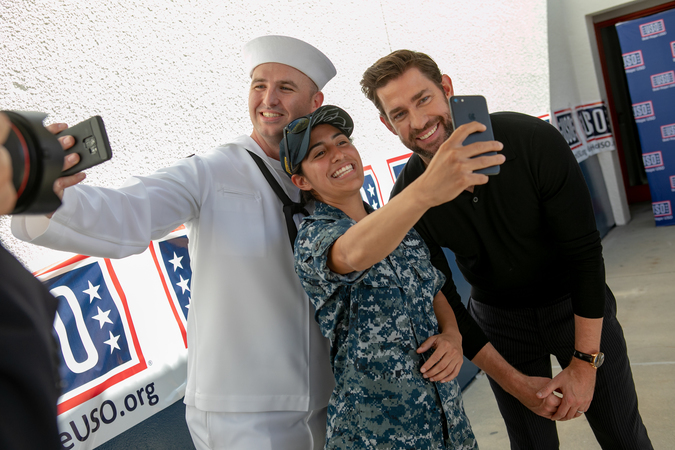 “Jack Ryan” star John Krasinski snaps a photo with a sailor during a USO tour during Los Angeles Fleet Week August 31. 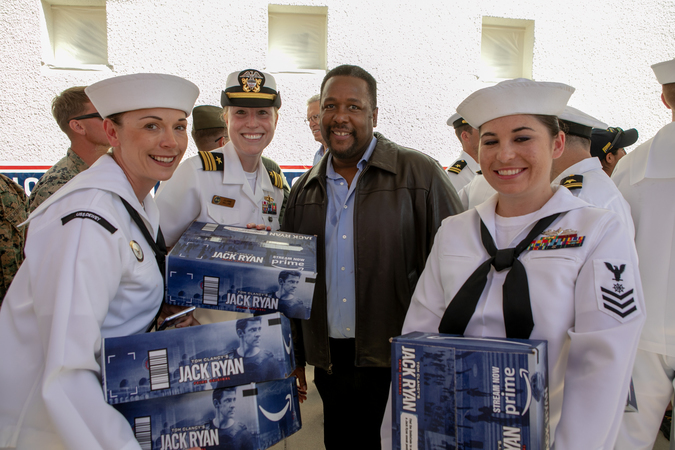 Actor Wendell Pierce, who stars in the new Amazon Prime series, “Tom Clancy’s Jack Ryan,” poses with sailors during a USO tour during Los Angeles Fleet Week on August 31. 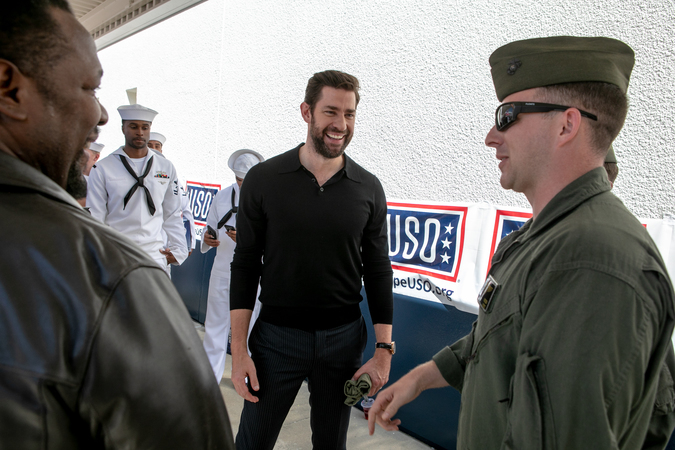 Actors Wendell Pierce, left, and John Krasinski, co-stars of the new Amazon Prime series, “Tom Clancy’s Jack Ryan,” connect with service members during a USO tour during Los Angeles Fleet Week on August 31. Actor John Krasinski, who stars in the new Amazon Prime series, “Tom Clancy’s Jack Ryan,” poses with sailors during a USO tour during Los Angeles Fleet Week on August 31. Krasinski also explained that participating in this USO event and giving back to service members was very important to him. Krasinski, Pierce, and screenwriter-producer Carlton Cuse, best known for “Lost,” had a chance to tour the USS Iowa and get a behind-the-scenes look at the daily lives of service members. Amazon also provided sailors and Marines with an exclusive screening of the show aboard the ship.